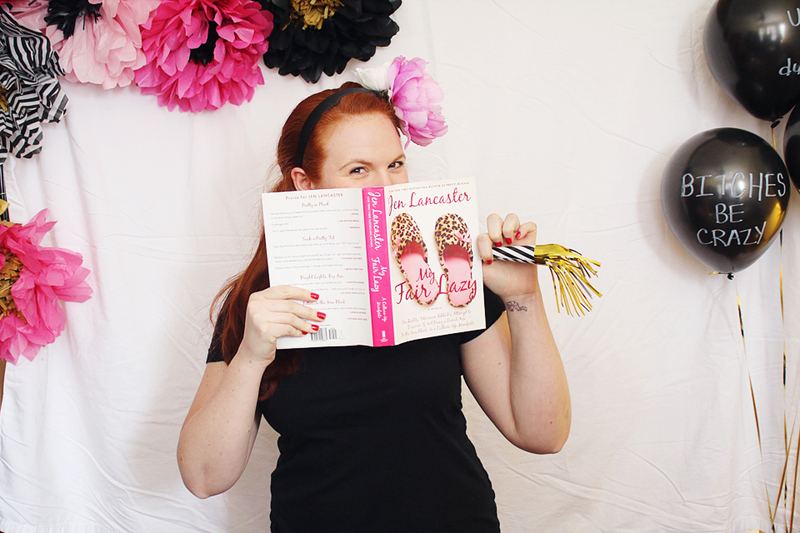 Now that the invitations have been officially sent out, I am super excited to share them here on the blog! I love paper invites sent through the mail, but I was running a touch behind and mail service in Chicago isn't always reliable so rather than risk them being lost in the mail, I decided to do e-mail invitations. I've seen Paperless Post and I love the idea of e-mailed cards and invitations that feel more special than e-vites. While I found a couple suitable options on Paperless Post, I had too strong a vision of what I wanted on the invitations so I decided to tackle them myself because I am that delicate balance of crazy and challenge-seeking. I created the gemstone background by photographing little gemstones on white poster board. 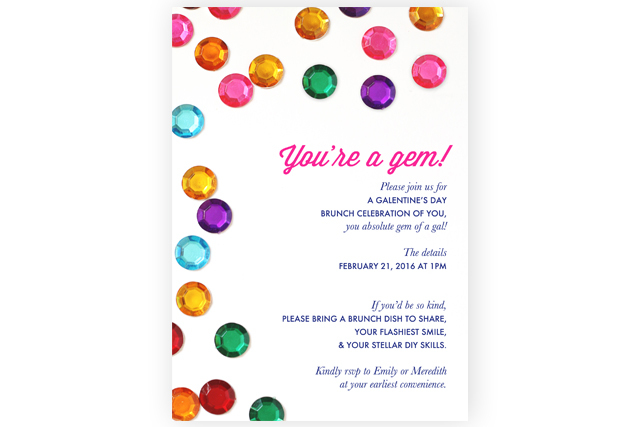 I designed the actual invitation in photoshop, using the gemstones as the background and adding in the text to the right. I cut a quick envelope liner, glued it in, and then photographed the envelope in various positions: facing up, facing down, and open. I photographed it on white poster board. 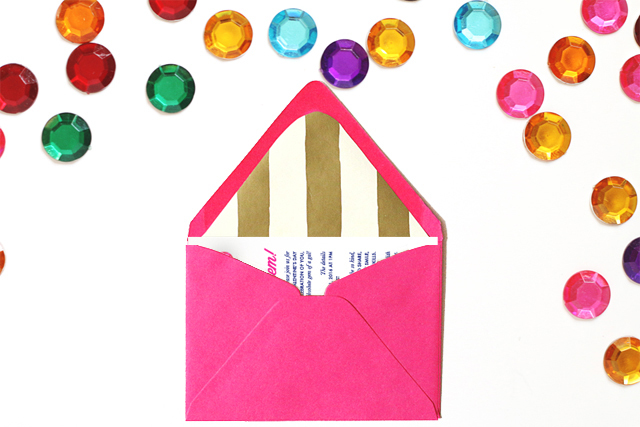 In photoshop, I copied the envelope onto the gemstone background and made jpegs for the envelope in each position. I added the invitation file to these jpegs. Using this tutorial, I turned these various files into a gif on photoshop. For the actual invitation e-mail, I slowed down the last frame so that it would stay on screen a bit longer so the recipient would have a chance to read it. I also included the invitation as an attachment just in case they had any trouble with it. So far the response has been pretty great! 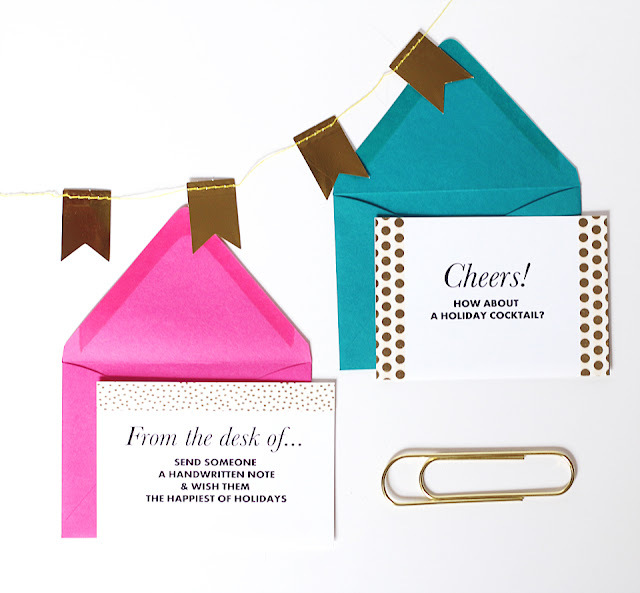 This just may become my new go-to invitation style. 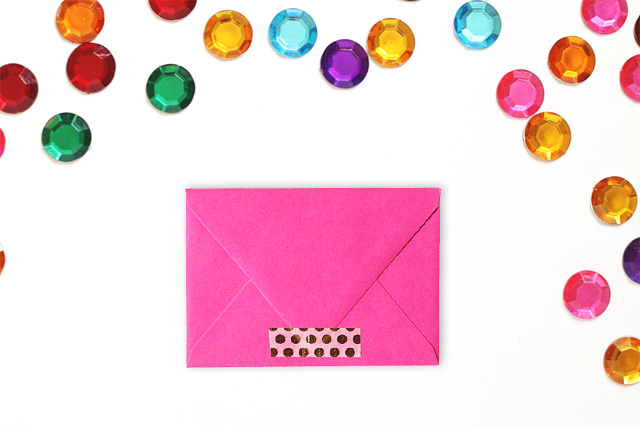 It's convenient yet still retains that special touch of paper stationery. 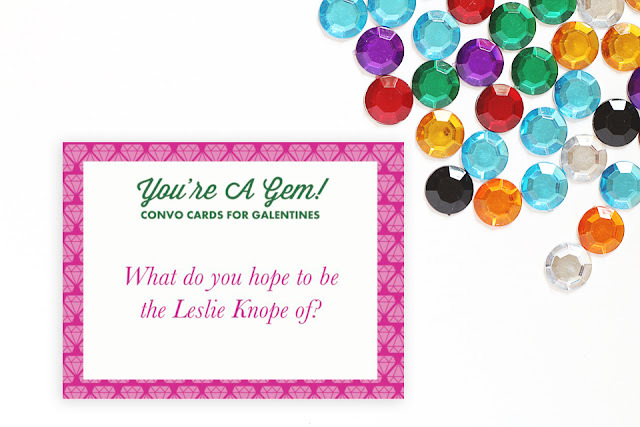 To see more of this year's "You're a Gem" Galentine's Day party preparations and to see last year's "Parks and Rec Inspired" party, click here! 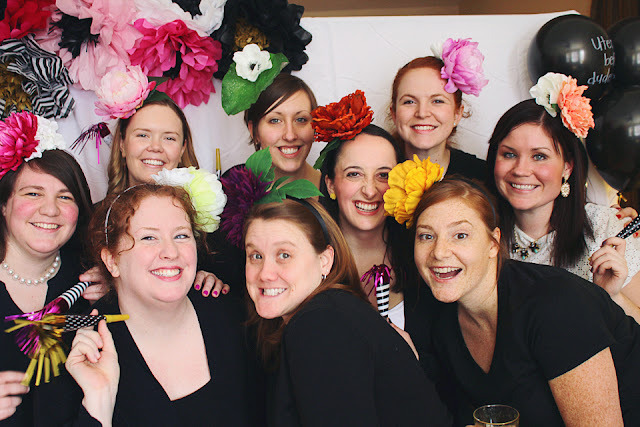 We are currently in the planning stages of our second annual Galentines Day party! We had such a great time last year, celebrating ladies and friendship, that we just had to do it again. 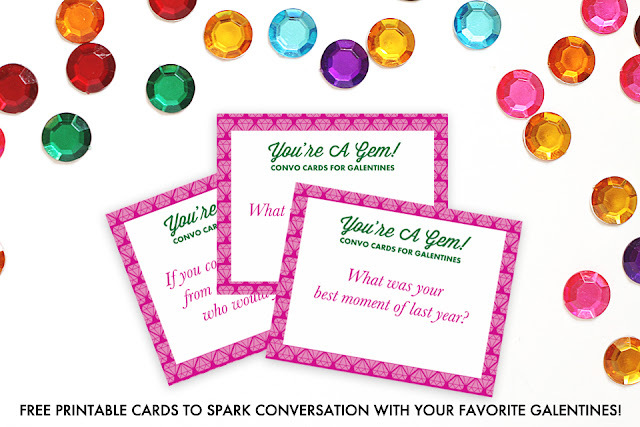 This year's theme is "You're a gem!" and though I don't want to give away too much before the party, I do want to share these little printable conversation cards that I created. My girlfriends and I see each other fairly regularly. Often we catch up on what is going on in our day to day lives. 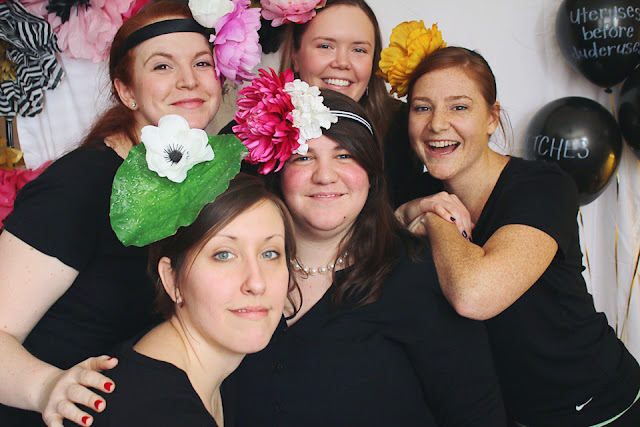 We talk about work, relationships, politics, and projects. My fellow party-planner, Meredith, and I looked for some conversation cards to spur conversation outside of what we might normally talk about. We found plenty of cards for spouses and families, but very few options for friends. So we decided to come up with our own! Some of these cards are silly and fun while others are a bit more serious. My hope is that these cards will get conversations started and then we'll carry on from there. 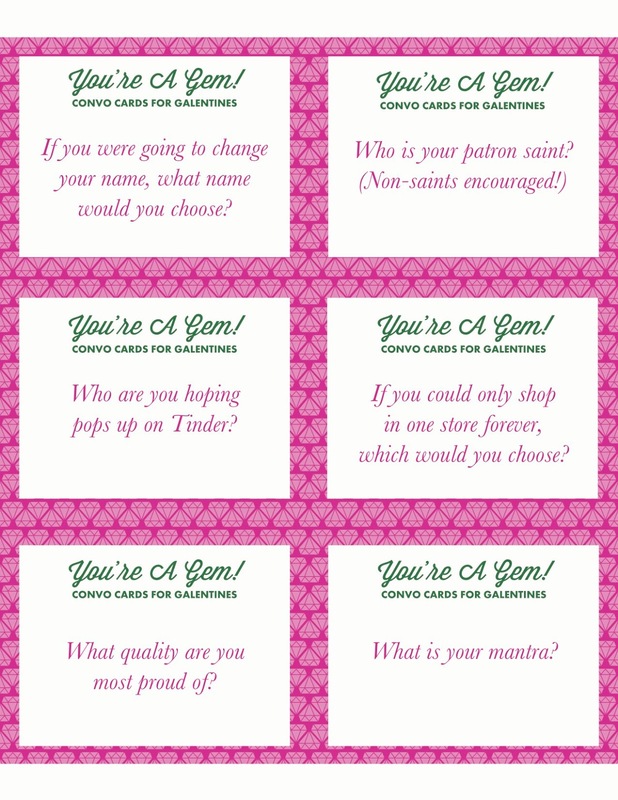 Feel free to print these cards and use whichever ones you like! 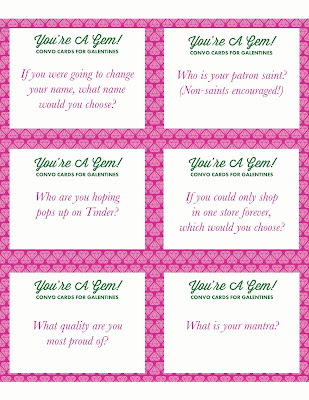 And please do let me know if you use them and how it goes at your Galentines Day party. 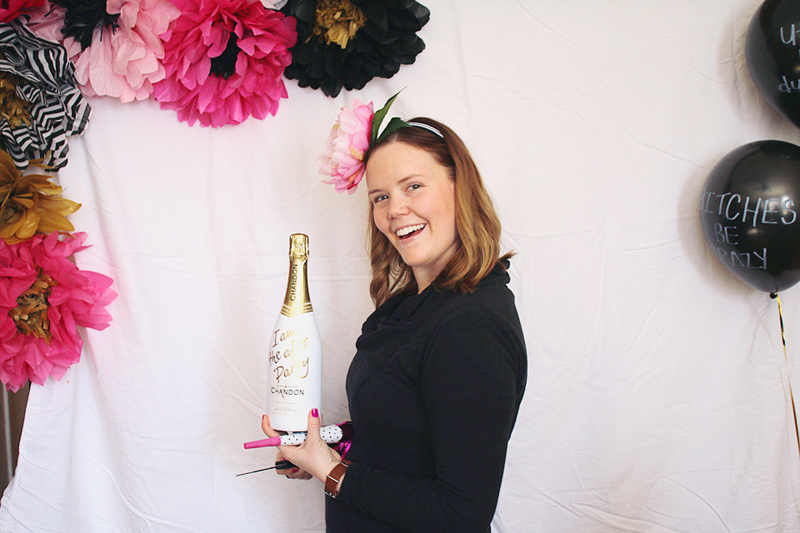 Happy Galentines Day and may your conversations be flow as easily as your champagne! I am quite suspicious of most any man who can be best described as "charming." I tend to associate charming with smarmy. That kind of man who effortlessly sashays into a room, winks at the ladies, and has them all swooning in under a minute. Ugh. I've known men like that and I can spot their smarminess like none other. I have quite close to zero patience for them. "something that is believed to have magic powers...."
Well if that's charm, then yes, please! Over the holidays, I worked in a retail store on the weekends and loved it. Most of what I loved about it is that it was so very different than my regular education administration position. At the store, I mainly greeted customers and just chatted. I asked how they were spending their holidays, gave suggestions of places to go in the city, found out lots about the people they were shopping for, etc. It reminded me that I do rather enjoy meeting new people and connecting with others. "Interact with people like they're already your friends." I love that idea and I think that is a major part of why my time working retail was such a joy to me. I simply pretended that the customers were good friends of mine! I had so many wonderful conversations during my time there and I am thankful for the chance to break out of my comfort zone a bit to rediscover how much I enjoy getting to know people. For so long, I've associated charm with insincerity, equating charming with ulterior and selfish motives. But charm, based in genuinely kind impulses, sounds positively wonderful. For this year, rather than a word of the year, I've chosen more of a phrase, "joie de vivre," and I think charm goes hand in hand with that. My goal for the year is to have fun. To complain less and express joy more. 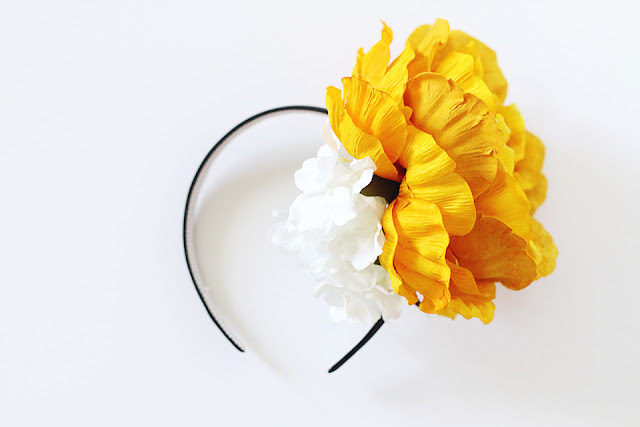 To be engaging and to show others just how fabulous I think they are. 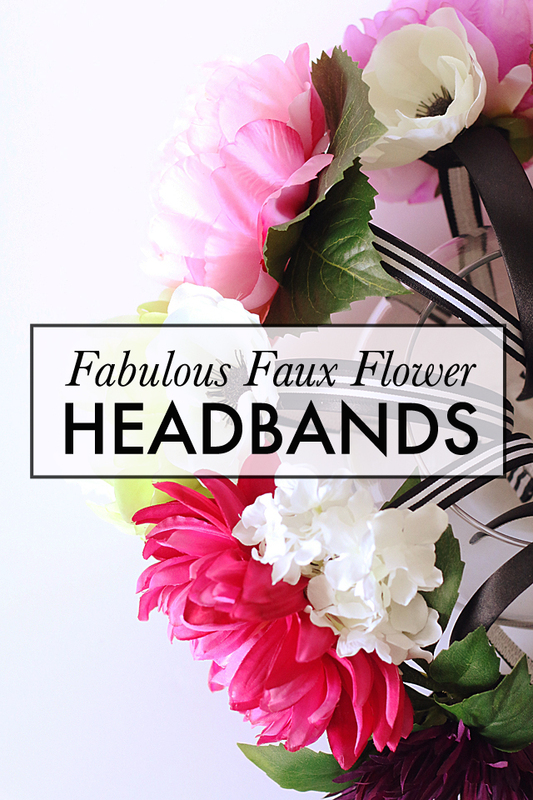 Because I do think they are fabulous and I want to be extra sure that they know. And I want to give the people I meet the benefit of the doubt. To treat them as if we are already friends and to get to know them as such. 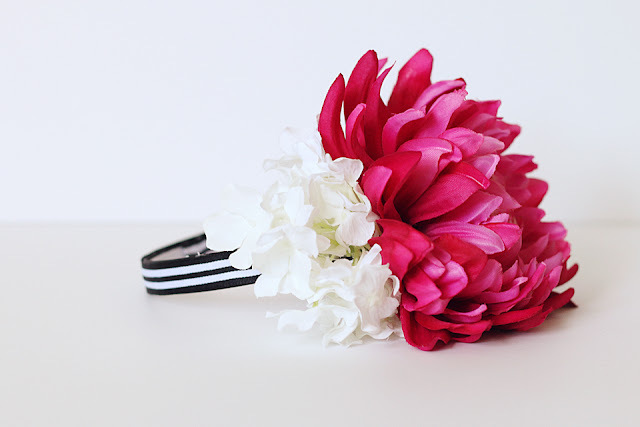 This year, I am hoping to make people feel great about who they are, with a bit of charm and joie de vivre. My friends and I don't typically exchange gifts during the holidays. Instead, we get together to watch movies and drink champagne and enjoy each other's company without the added stress of holiday shopping. But because I absolutely love the holidays and spreading cheer, I wanted to do something festive for my friends. One day while perusing Pinterest, I came across this fabulous wall done a few years back at Kate Spade. 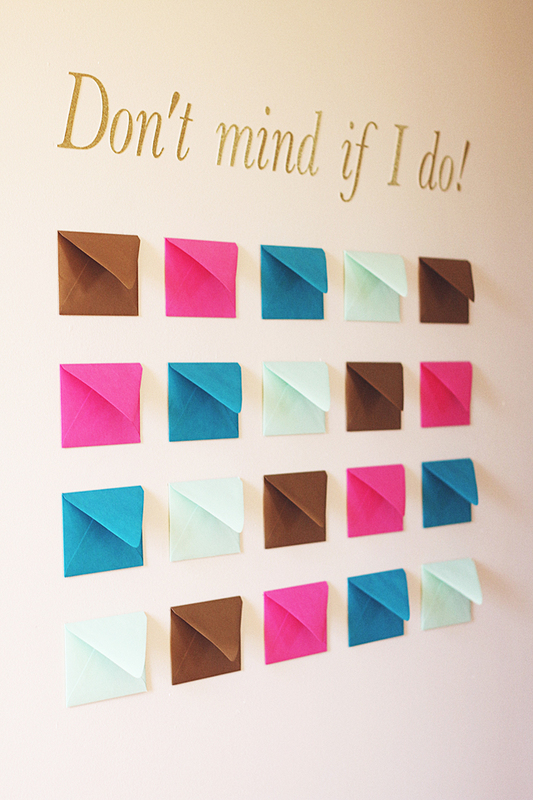 I loved the look of all those brightly colored envelopes lining the walls and I loved loved loved the idea of a surprise in each envelope! I purchased 24 envelopes of varying colors and began brainstorming ideas for each of the 24 cards. I decided I wanted the cards to be a mixture of ideas for celebrating the holidays, invitations to celebrate with us, ideas for brightening the holidays for someone else, and $5 gift cards to some of my favorite places. I then typed up my cards, decorated them with some gold washi tape, and slipped them into the envelopes. As friends visited through out the holiday season, I invited them to pull a card from one of the envelopes. It was so fun to see how excited they were and to have them read the cards. 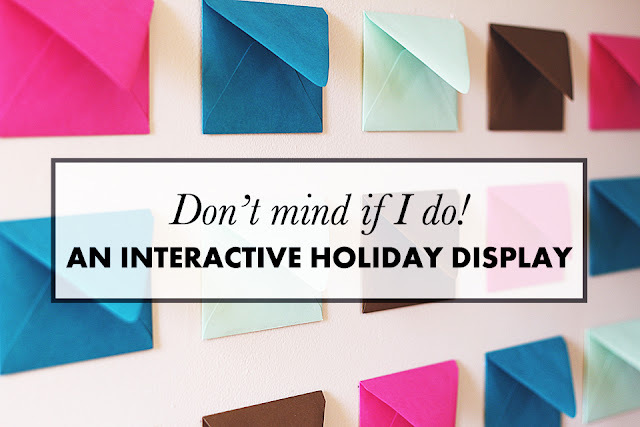 I loved having this display during the holidays so much that I have been brainstorming new cards to fill the envelopes through out the year. Maybe some inspirational quotations? 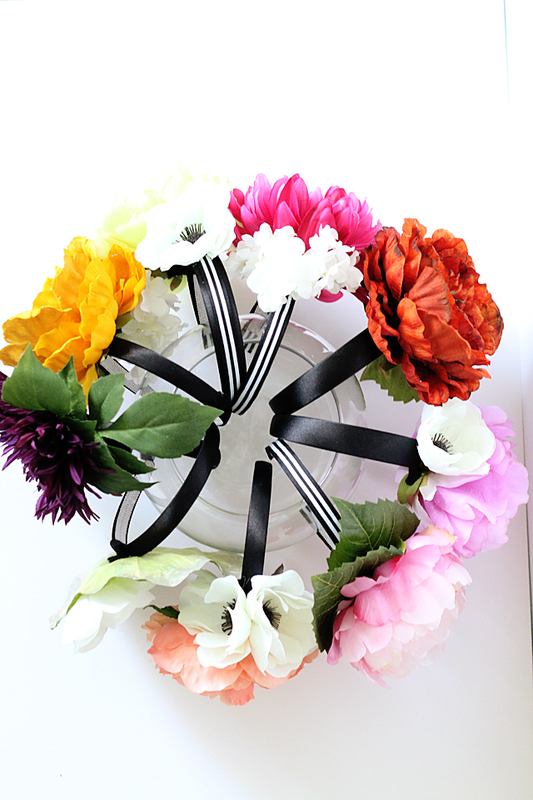 Ideas for brightening someone else's day? I'm not sure, but I know I want to keep this around for a while! One of my favorite things that came out of planning last years' Galentines' Day party was these fabulously oversized faux flower headbands! 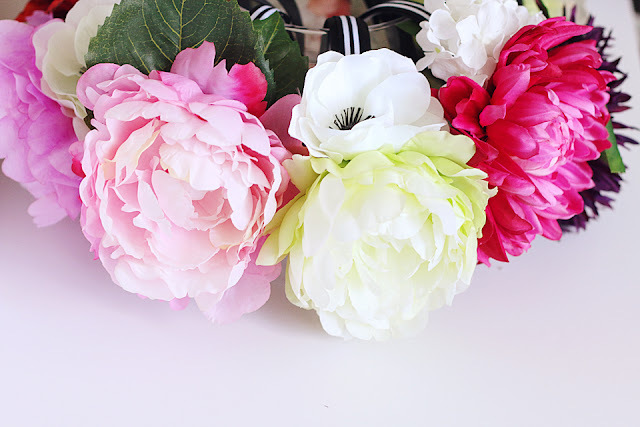 We initially spotted them on pinned from the A Beautiful Mess Blog. 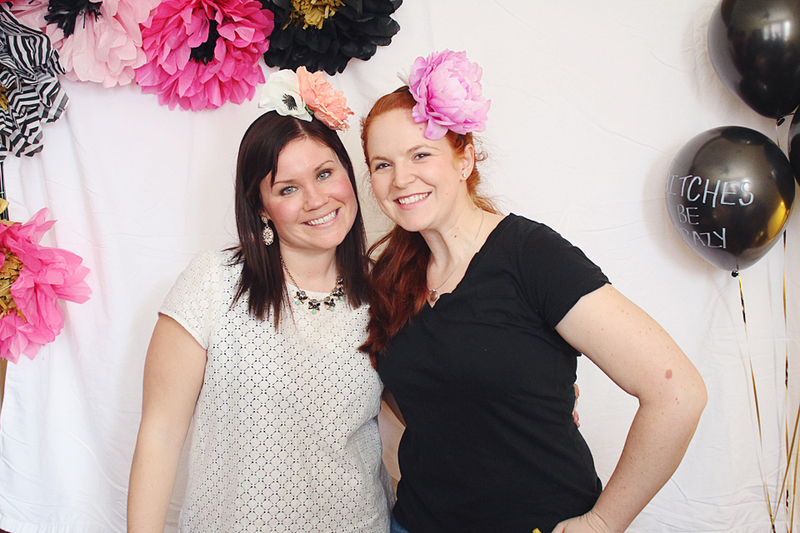 We loved the idea of using large blooms and making them statement pieces for our photobooth. So we quickly got to work! We picked up all our flowers when they were on sale at Michaels. We grabbed lots of different colors and tried to balance out the large statement blooms with smaller filler flowers. Once we got home, we sorted through the flowers and started imagining the headbands. 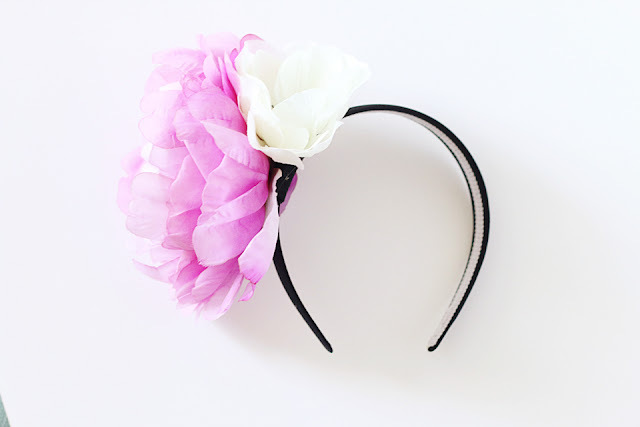 On a few headbands, we started by gluing down a piece of the black and white ribbon we had picked up. From there, using a hot glue gun, we easily glued the blooms to the headbands. 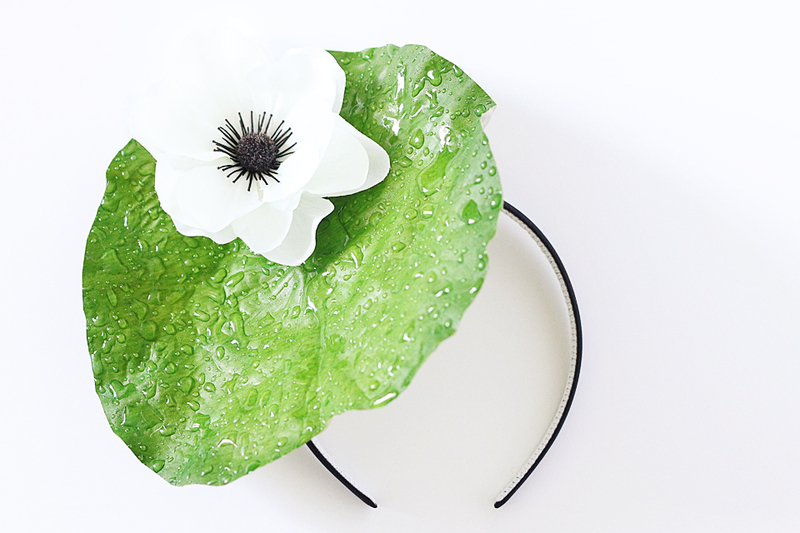 From the beginning, my friend Ashleigh had decided she wanted to do a leaf-based headband. At Michaels, she found this fabulous faux lily pad. I absolutely love how she created hers. I would have never thought of it! Honestly, how awesome is that lily pad headband?! In the end, these floral headbands were super easy and so, so good for the photobooth! 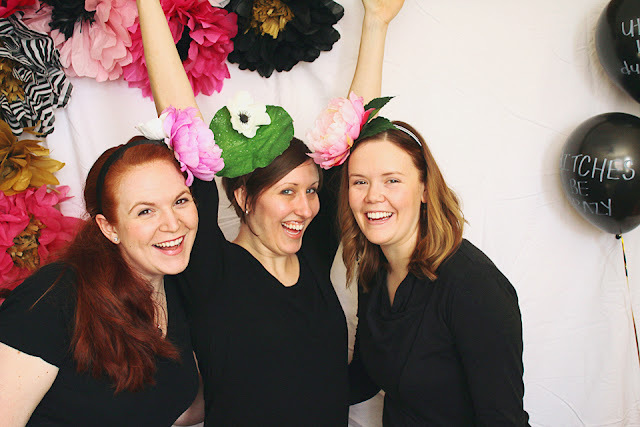 They were easy enough that it might even be fun to make these as part of your Galentines' Day party! 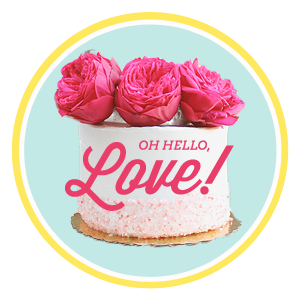 Be sure to let me know if you make some to share with your favorite galentines! 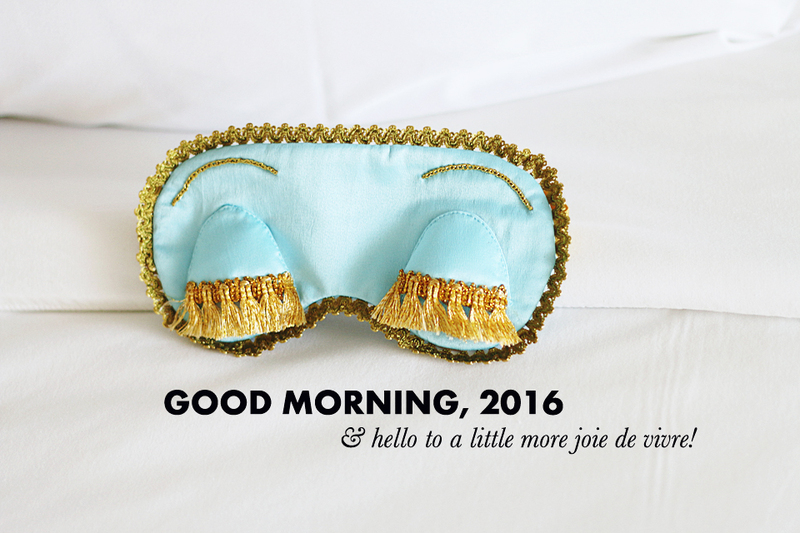 Holly Golightly eyemask purchased here! When I was in high school, my friends used to say that you could always hear me coming down the hallway. My laugh always preceded me. In all my high school days, I received just one detention. It was for talking too much in study hall. I was bright and a touch loud and I had that joie de vivre that accompanies being young and blissfully unaware of true struggle. The other day at work, a coworker commented that he always knew I was coming down the stairs when he'd hear the door open and close and then silence. He said I have the lightest footsteps and that he knew me by the lack of sound. I spent so many of the last few years worried and tired and overwhelmed and anxious and heavy-hearted. So many years wondering if we'd just be okay. I don't regret these years. They've made me more resilient and sympathetic. They've filled me with compassion and a desire to work to fix some of the wrongs. These years made me a better listener and a compassionate friend. I remember how friends and family supported me on the darker nights and I am a better friend because of that. During the difficult days, my dad continually reminded me that these were times for character-building. And I am admittedly quite thankful for the positive ways in which this immigration process has strengthened me. While our current phase of life is relatively unburdened, I know that there will be difficult days on the horizon and when those days come, I will face them with the resilience and strength that developed during this immigration process. But after years of making sure not to call attention to ourselves, I think I am ready for a bit more of that joie de vivre that I had when I was younger. And this time, it won't be the joy that accompanies blissful ignorance, but rather a joie de vivre that accompanies having passed through true adversity and come out on the other side. Yes, I am hoping for a bit more panache for 2016. 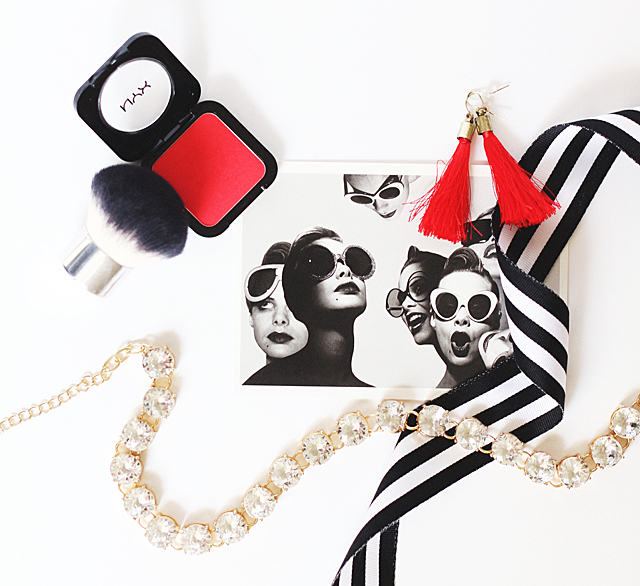 A touch more vivacity. And maybe even a bit of sparkle. But I do still detest the sound of that word. We are back with another bracket for this season of The Bachelor! I've filled in the first week for you since my friends and I like to start with the second week. It's hard to predict when you haven't even heard from any of the girls. 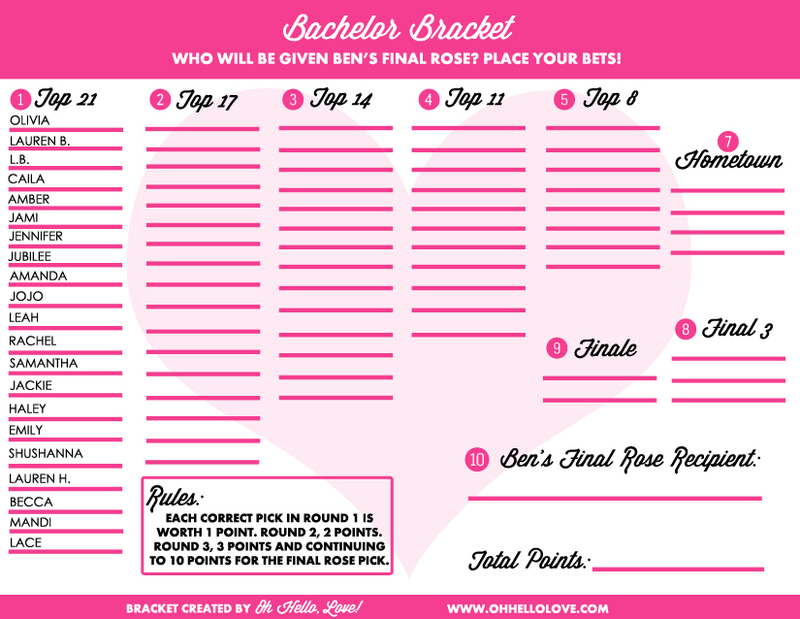 You can go ahead and download your free printable bachelor bracket here! For years, I dreamed of what it would be like to finally type those words and to publish them without fear. And sometimes I did type them, just to see what it would feel like. Then I'd erase them or hide them away because the risk was too much and the anxiety too great. 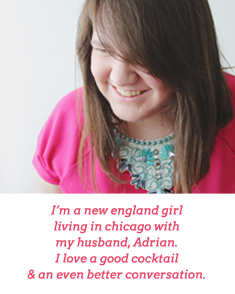 In February of last year, Adrian became a legal permanent resident of the United States. Most of me can't believe that those words are even true because for years, I rarely allowed my thoughts to wander so far. Contemplating life as legal residents seemed too sweet and the disappointment, should it not happen, was far too devastating. So I researched and I mentally packed and I prepped myself to move abroad because I figured that if that happened, well, at least I should be logistically ready, knowing that my heart would never be. My husband was undocumented and now he isn't. It is true and real and I still can't believe it. After five years married, two years dating, one year of friendship and innumerable hugs and tears and phone calls and separated holidays and lonely flights and nightmare-filled nights and thousands of dollars and hundreds of pages of paperwork, we are here and we are together and we are fine. My husband was undocumented and now he's not and we used to live in a small, dark apartment but now we live in this lovely little apartment high up with lots of sunlight. We moved because we finally could. No more lawyers fees and immigration fees. Plus Adrian can pass a background check now. And we saw a rat in that small, dark apartment. So we left. Within hours. In the new apartment in the mornings, I make my bed as a gift to my afternoon self. In the afternoons, I come home from work and I close myself in my bedroom. I lay on my bed with the curtains open, treating myself to all that beautiful natural light that my old bedroom never had. And I sit there. I sit and think and listen to the muffled sounds of my husband making dinner in the kitchen. Because I still can't believe it. I still can't believe that I have this life that I prayed for night after night. “Please Lord, just let me have this little life,” I'd plead. This little life where my husband comes home every day after work. Where an unanswered call doesn't mean he's been detained, soon to be deported. Where we both have opportunities and, finally, achievable dreams. And where we are fearless and hopeful. Most every day, I am so very aware that this life may not have been. That ten-minute interview through a plexiglass window could have ended with those much anticipated words, “I'm sorry. You've been denied.” And it would have made just as much sense because it happens every day. And it happens to good, good people with a deep love. And it could have been us. It so easily could have been us. This year, I have a renewed sense of awe. Because it was almost us, but it wasn't. I want to remember how close we came and how hard we fought and how much we wanted this life together. And I want to take time each day to simply be in awe of this small life we have that almost wasn't. My husband was undocumented and now he isn't. I've waited so long to type those words.